Imported from France, our Eye Shadows are a rainbow of beautiful, radiant shadows encompassing the full spectrum of color. The unique Wet/Dry formula that can be used as a shadow or a liner, leaving a satin finish that lasts all day and into the night. There are 17 color families, divided into Cool and Warm so you can always find the perfect shade for your skin tone. 6 highly-shimmering wet/dry Special Effects shades add dazzle to any look. 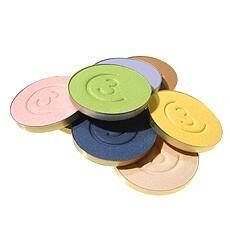 Try highlighting the cheeks or decollete for extra glamour!